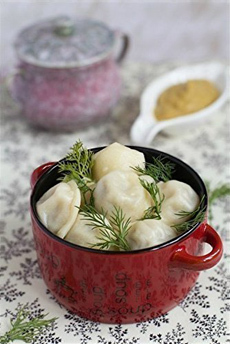 Top: Pelmeni with Russia’s favorite herb, dill (photo Amazon). Center: Meat stuffing in a pelmeni mold (photo Amazon). Bottom: Ready to cook (photo MumsPrefer.com). You may have had Polish pillow pasta—pierogi—but how about their Russian cousin, pelmeni (pell-MEN-ee). As with dumplings the world over—including ravioli—a simple dough rolled out and stuffed with beef, cheese, chicken, mutton, pork, seafood or vegetables. Or, they can be a blend: A traditional recipe combines beef, mutton and pork. In Europe, add some garlic, onions and pepper to the mix. Historians agree that pelmeni originated among the indigenous Siberian people and later became part of Russian cuisine; they are also called Siberian dumplings in Russia. The word translates to “ear bread”: The bite-size dumplings can be seen as little ear pasta (although not nearly as ear-like as Italian orrechietti, which have the advantage because they aren’t stuffed). Pelmeni were a particularly good way to preserving meat during the six months of Siberian winter, with temperatures as low as -47°F and snow on the ground through April. It became a tradition in Siberia households to make thousands of pelmeni as soon as temperatures fell below freezing, in November. Long before electric refrigeration, Siberians had natural refrigeration, i.e., in an unheated barn or shed. A bonus: Livestock could be harvested before the freeze, eliminating the cost to feed them over the long winter. Pelmeni have evolved from labor-intensive food prepared by housewives to quality frozen versions to the Russian student substitute for instant ramen noodles! European stuffed boiled dumplings may be a simplified version of Chinese wontons. The list of cousins includes Chinese jiaozi, Georgian khenkali, Italian ravioli, Japanese gyoza, Jewish kreplach, Korean mandu, Middle Eastern shishbarak, Mongolian bansh, Nepalese and Tibetan momo, Polish uszka, Turkish and Kazakh manti, Ukrainian vareniki and Uzbek chuchvara, among others. In the U.S., the term pierogi is often used to describe every type of Eastern European dumplings. Of course, there are differences: in shape, size and thickness of dough (these are the differences between all dumplings, as well as cooking technique: boiled versus fried, boiled in water vs. broth or stock). 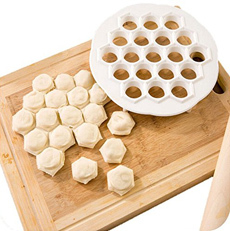 With pelmeni and vareniki, the dough is as thin as possible, and the proportion of filling to dough is high. Pelmeni fillings are usually raw, while pierogi and vareiyki can be sweet. Pelmeni are bite-size, like raviolini. Similar to making ravioli, you can short-cut the process by purchasing a pelmeni mold in plastic or aluminum—and make other types of stuffed pasta with it. Or, look for a good brand. We recently tried Popkoff’s, and were very pleased. Use the store locator to find the nearest retailer. These delicious dumplings, full of Old World flavor, are easy to prepare. It takes just 5 minutes from boiling water to plate. The simplest preparation is a traditional one: butter and sour cream, with fresh dill. The dumplings can be served as an appetizer, side or main dish. Or, add a bit of smoked salmon and caviar for a luxurious hors d’oeuvre. Why do Popkoff’s pelmeni taste so good? Their “farm to frozen” pelmeni and vareniki are made from 100% all-natural ingredients from the best vendors: King Arthur Flour, Mary’s Free Range Chicken, Meyer Natural Angus Beef, Marcho Farms Veal and Good Nature All-Natural Pork. All ingredients are domestic and the dumplings are made in California, and are packaged in GoGreen sustainable packaging. The meats are antibiotic-free and hormone-free, the fruits and vegetables are locally grown and non GMO. There are no artificial colors, flavors or preservativess. Pick a topping, pick a sauce. Some of these are traditional, and some reflect modern tastes. You can also add pelmeni to broths and green salads. They are traditionally boiled; vareniki can be boiled or pan-fried. Also, check out our 50 ways to serve pierogi and adapt them to pelmeni. You can make this recipe from Chef James Bailey from scratch (recommended), or take a shortcut with canned cream of mushroom soup. It’a a variation of the famous Russian dish that originated in the mid-19th-century rage, Beef Stroganoff, which has a sauce made with sour cream (smetana in Russian). Prep time is 15 minutes, cook time is 20 minutes. 1. MELT the butter over medium heat; add onions and cook until softened. Add the garlic and mushrooms; stir and cook for 3-5 minutes until the mushrooms have softened. 2. ADD the beef broth and cook over medium heat until the liquid is slightly reduced. Add the heavy cream and season with salt and pepper. Cook for 2-3 minutes until the sauce is combined. 3. BRING a large pot of water to boil and add a pinch of salt. 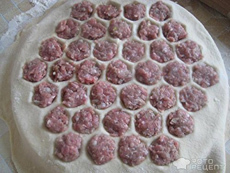 Carefully add Popkoff’s Beef Pelmeni and cook for 5 minutes until cooked through. Drain and reserve. 4. 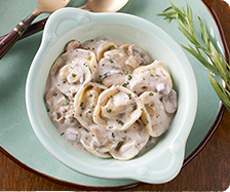 MIX in sour cream and chopped parsley into mushroom stroganoff, portion dumplings onto plates and top with sauce, optional toppings and dill garnish. Pelmeni stuffed with delicate farmer’s cheese is a charming dessert or a sweet lunch. Vareniki are typically used for dessert because the cheese can be sweetened. Cheese pelmeni has no sweetener. 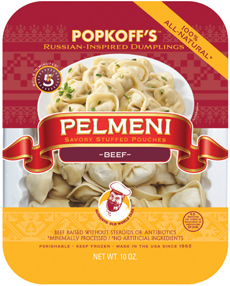 Top: A package of Popkoff’s Pelmeni. 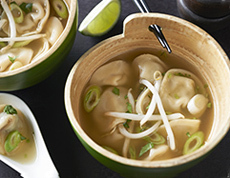 Second: Pelmeni in miso soup. Third: Pelmeni in mushroom sauce. 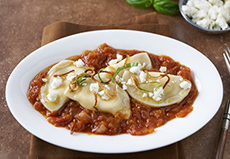 Fourth: Pelmeni with Moroccan-spiced tomato sauce. Fifth: Vareniki with farmer’s cheese and cherries. Sixth: Dessert vareniki. 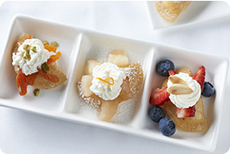 Photos courtesy Popkoff’s (see the recipes). Bottom: Vareniki stuffed with cottage cheese and blueberries, with blueberry sauce. Here’s the recipe from ToDisCoverRussia.com.